Get a Free Mini Frozen Yogurt at Pinkberry. 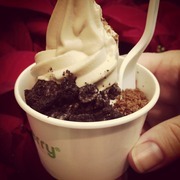 (1) Offer is good only for a Free mini size Yogurt at Pinkberry with toppings worth up to $3.75. (2) Offer cannot be combined with any other offers. (3) Offer only valid through November 23, 2012 though Treat Cards that have been sent using this offer have 3 months to be used. (4) Limit one offer per person. (5) Treater has the sole right to modify or terminate this offer at any time with or without notice. (6) Offer is valid only in the US.